The U.S. Census Bureau reported Tuesday that the March goods and services trade deficit was $51.4 billion. This was an increase of $15.5 billion, or 43.1 percent, from the revised figure of $35.9 billion in February. March exports were $187.8 billion, up $1.6 billion from February. March imports were $239.2 billion, up $17.1 billion from February. The monthly U.S. goods deficit with China increased in March to $37.8 billion, up from $27.3 billion in February. This is the highest monthly deficit with China on record. The U.S. goods deficit with Japan increased in March to $6.3 billion, up from $4.3 billion in February. The U.S. goods trade deficit with Korea has more than doubled in the full first three years since the U.S.-Korea free trade agreement (FTA) went into effect. In those three years U.S. goods exports to Korea have dropped 6 percent, or $2.7 billion, while goods imports from Korea have surged 19 percent, or $11.3 billion compared to the year before implementation. 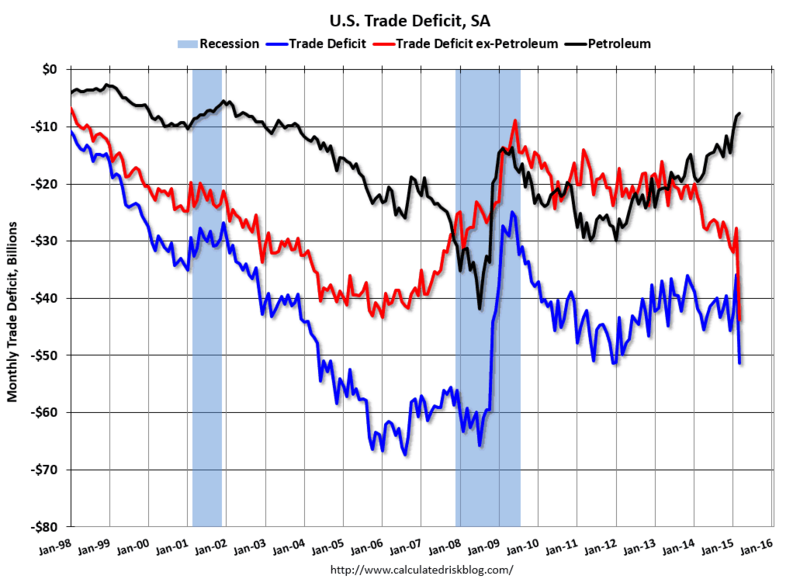 A major cause of the increasing trade deficit is that the U.S. dollar is particularly strong. This means American-made goods and services cost more than goods and services from other countries with weaker currencies. 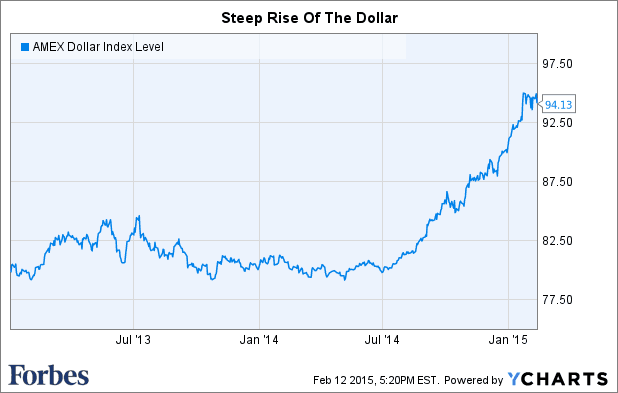 This is the result of currency manipulation by other countries, and our own strong-dollar policy. The mighty greenback has been a common theme in earnings reports from behemoths that make a large chunk of their money outside the country. Why? A stronger dollar means sales abroad translate into fewer dollars back home, a reality that is making its way into many corporate forecasts after the dollar rose 6% against other major currencies in the fourth quarter and has climbed another 3% in 2015. Oil imports averaged $46.47 in March, down from $49.53 in February, and down from $93.91 in March 2014. The petroleum deficit has generally been declining and is the major reason the overall deficit has declined since early 2012. 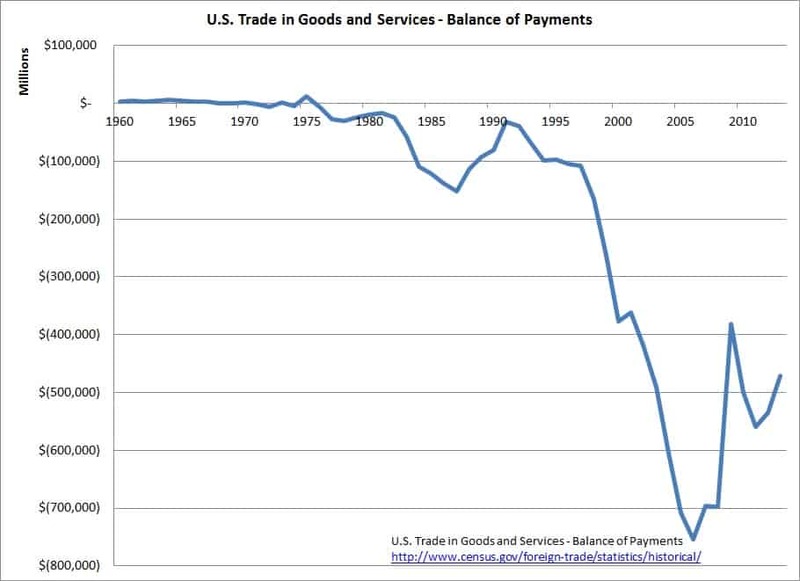 Finally, America’s “free trade” policies since the late 1970s account for most of this deficit. The March trade numbers show there is increased demand in our economy, enough to create a lot of jobs and make businesses a lot of money. And that is exactly what we did in March. But thanks to our trade policies we created them somewhere else because we import more than we export. If you make things and sell them, you do better over time than if you borrow to buy things. If you send jobs and factories out of the country, you end up with devastated cities like Baltimore. 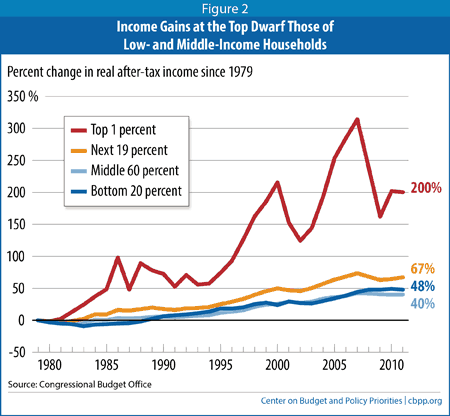 Sure, a few people get rich from that, but 99 percent of us get poorer. How hard is it to see that? This didn’t just suddenly happen. Globalization is not some kind of inevitable natural process of history that has caught up with us. This was and is the result of intentional policy choices, designed to force deindustrialization, break unions, drive down wages and benefits and increase inequality as that pay differential is pocketed by a few. 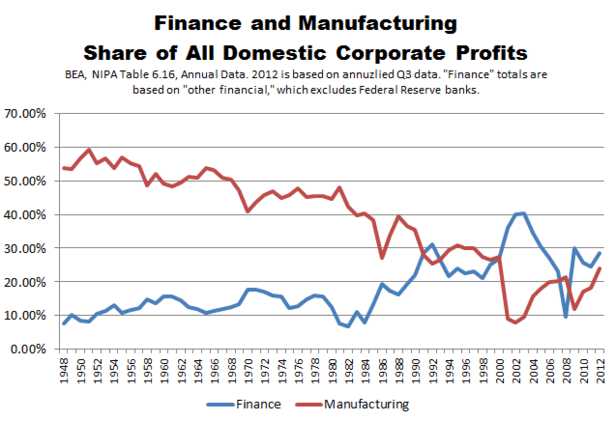 This is the result of the “free market, free trade” ideology that rose up in the late 70s. Free trade policy was and is designed to give a few plutocrats and their giant corporations — “the 1 percent” — increased power over governments. It’s time to change our trade policies so they work for We the People not just a few already-wealthy people. We should demand balance. Trade partners should agree to actually “trade” with us, not just sell to us. We should also balance the interests of working people, the environment and other stakeholders with the interests of businesses in our trade negotiations. We should set a priority of lifting wages and prosperity on all sides of trade borders, instead of a priority of lifting only the world’s 1 percent. Democracy and transparency can work for all of us. All of us do better when all of us do better.